History/Characteristics of Late Kingdom Building Design. Includes: Emperors Augus, Claudius, Vespasian, Trajan, Hadrian and others. The end of the New Kingdom was followed by political debility, domestic turmoil and impoverishment, pressures from without, and foreign rule, and during these times the opportunities for Egyptian architects diminished. (Compare the opportunities afforded architects like Imhotep during the Old Kingdom.) There were frequent shifts of the capital, mostly within Lower Egypt. Memphis rose repeatedly to prominence, but there and throughout the Delta virtually nothing has survived to supplement the buildings of the Late Period that still stand in Upper Egypt. See also: Mesopotamian Art. The occasional partitioning of the country and the frequent changes of dynasty weakened and secularized the kingship. No large royal tombs survive, not even those of the native kings from Sais, Mendes, and Sebennytos in the Delta. The same can be said of monumental Egyptian sculpture in Upper Egypt. 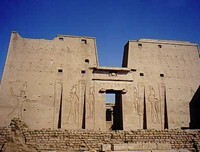 According to Herodotus, the kings of the Twenty-Sixth Dynasty, like those of the Twenty-First Dynasty at Tanis, were buried according to ancient Lower Egyptian custom within the temple precincts of the local deity. The Egyptianized Ethiopian kings of the Twenty-Fifth Dynasty, in their capital of Napata below the fourth cataract, were buried in small, very steep pyramids with a mortuary chapel on the east side. A brief revival occurred, however, after the period of Persian rule. The Pharaohs of the 28th, 29th and 30th Dynasties brought a new energy and focus to their Pharaonic role as keepers of a long tradition. They instituted a huge new program of ancient art - namely temple building, along with greatly increased production of monumental statues to express a reinvigorated concept of divine kingship. In addition, they formalized numerous other aspects of Egypt's artistic traditions. The kings of the Ptolemaic dynasty (323-30 BCE), the successors of Alexander the Great, also enriched Egyptian art with a wordly perspective. But they resided in their newly founded, purely Hellenistic capital of Alexandria, where they were buried in tombs of which nothing has been preserved. See also Greek Art (650-27 BCE) and Greek Hellenistic Sculpture (323-27 BCE). For an insight into Greek-Egyptian art, see: Fayum Mummy Portraits (50-250 CE). Throughout and after the first millennium BCE native and foreign rulers alike continued to assume the ancient role of the Pharaohs. The basic Egyptian concept of the king ruling with the god in the interests of world order continued to be preserved, at least as a fiction. The maintenance and embellishment of the famous old sanctuaries and the erection of new temples continued to be a royal obligation. Wearing pharaonic regalia, Ethiopians, Persian kings, Macedonians, and Roman emperors appear in reliefs and inscriptions venerating the Egyptian gods and confirming the god-given cosmic order in the prescribed rites. Pomp and ritual establishes inwardly and outwardly their legitimate royal claim by way of the old forms of architecture, sculptural reliefs faithfully reproduced, and statues following the Egyptian canon. The building activities in the Nile Valley of the Ethiopians, the Saitic dynasty, and the Persians are hardly noteworthy. (But see also Ancient Persian Art 3,500 - 330 BCE.) Large-scale building throughout the country was resumed only under the kings of the Thirtieth Dynasty. The Ptolemies completed temples already begun, such as Nectanebo II's temple of Isis built all of granite in the Delta - the celebrated Iseum of Roman times, later destroyed by an earthquake and today only an imposing heap of ruins. The Ptolemies and Romans built temples throughout Egypt, including Nubia; preference was given to places that had special political and religious importance in maintaining the accustomed order and legitimate rule. (The greatest architects, however, remained in Rome.) The large temples of Upper Egypt stand on hallowed ground and, appealing to the oldest traditions, were rebuilt over ancient sanctuaries which they far outstripped in size and splendor. The most important and best preserved are at Dendera, Esna, Edfu, Kom Om-bo, Philae, and, among the Nubian temples, Kalabsha. Architecturally each temple has a marked individuality determined by the local tradition of its principal deity and subsidiary cults, and each makes an appeal through inscriptions to a venerable history reaching back to the age of myth and the days when the country was first united. The orientation of the temples is determined by their particular location on the east or west bank and by the usually north-south course of the river. The clear axial arrangement and spatial succession, extending from entrance portal to holy of holies, divides the temple into two halves, one on the north, one on the south, whose plan and arrangements correspond to one another in their inscriptions. There is regularly a canal leading from the Nile to the temple precincts furthest inland. The traditional festivals, in which, for example, Hathor of Dendera visited Horus of Edfu in his temple almost one hundred miles up the Nile, required these waterways for transporting the cult image on the sacred barge. The temple precincts were always sheltered from the impure world outside by high brick walls and were entered through monumental stone portals. One such portal, dating from Ptolemaic times, has been preserved at Karnak. The sacred enclosure included the temple of the principal deity, the sacred lake, a well (whose water level simultaneously indicated the state of the Nile), the smaller sanctuaries of lesser gods, and, after the fourth century BCE, the "birth house," usually situated to one side of the main entrance facing the approaches to the temple. A new, lively, and especially versatile element, characteristic of the temples since the fourth century BCE, is the column capital. From the older plant-form columns late temple architecture retains only the palm and lotus columns in their original form; no use is made of the various older forms of pillars. The new capitals all develop from the papyrus plant in bloom. Two basic forms may be distinguished: first, the full-blown bell-shaped papyrus capital decorated with vertical plant ribs, leaves, and floral ornament in finely graded relief; second, large semicircular papyrus blooms arranged to form a circle in the upper part and interlaced below with smaller blooms, composing a sort of bouquet. These forms have many variants and the capitals may change within the same building or even from column to column within the same row. To describe the oldest and largest of these Ptolemaic temples, the temple of Horus at Edfu, is in a sense to describe them all. The construction took about 180 years (237-57 B.C.). The massive pylons (see Architecture Glossary) and main gate of the pylons, form the side walls of the great court, and enclose the temple face south. High stone walls with concave and roll moldings on the outside abut against the backs of the temple structure on the other three sides. The court, "the hall of the masses," was open to the people. Porticoes, their architraves surmounted by concave and roll moldings, surround it on east, west, and south (including the side backing the pylons), stopping just short of the actual temple. The main temple building is divided clearly into two parts, differentiated by unequal height, width, and depth. Fronting on the court is the great hypostyle hall, a broader and taller "antechamber" to the closed, elongated sanctuary behind. The intercolumniations of the facade, apart from the central portal with its cropped architrave and doors that could be closed, are filled by stone screens half the height of the column shafts and preventing a view of the interior. These screens are edged with fillets and crowned by a concave molding with a uraeus frieze; their outer faces are decorated with relief sculptues. They are derived ultimately from the mats stretched between the fluted posts of tent structures, reproduced in stone in King Zoser's mortuary precinct. As an architectonic element with concave and roll moldings they are first represented in the small chapel in a New Kingdom tomb, and they appear in stone construction in the Twenty-Second Dynasty temple of Amon, built at el-Hibe in Middle Egypt. The great hypostyle hall, like an independent building, has moldings at the four outer corners, at the top of the outer walls, and above the architraves in the facade, and the whole is crowned by a massive cornice. Its floor is one step above the level of the court. Built onto the back of one of the screens of the front colonnade is the library, whose catalogue of papyrus rolls is recorded on the inner walls of the small chamber. The hypostyle hall is a special feature of the temple; at Dendera the hypostyle hall was added in Roman times to the already-completed temple. The front of the narrower and lower temple block overlaps with the rear wall of the great hypostyle hall. On the axis of the temple, a monumental portal closed with two huge doors leads into the "hall of appearances," which is narrower than the full width of the temple; its ceiling rests on columns. When the doors were closed this hall, and indeed the whole interior of the temple proper, lay in darkness; only narrow slits in the ceiling admitted occasional dim light. In the "hall of appearances" was displayed the cult image, together with those of the lesser gods also worshipped in the temple; here the processions were organized on festival days. The hall is flanked by smaller chambers where the unguents for the cult image were prepared and the temple treasures stored. A small door led out to the well that supplied the pure water needed in the daily ritual. The next chamber is also a transept hall, but without columns; it is the "hall of offerings" where three times each day the food offered to the god was served and consecrated. On both sides of the "hall of offerings" narrow steps lead up to the roof; one goes upward in a single straight flight, and the other, four flights of gentler steps arranged around a square, was for coming down. On the side walls are reliefs depicting processions, the gods going up or down according to the design of the stair. Beyond the "hall of offerings" begins the holy of holies, which, with its accompanying chapels, occupies the entire rear part of the temple. It begins with the "middle hall," also referred to in the inscriptions as the "hall of the multiplicity of gods." This chamber forms at the same time the threshold to the sanctuary; the floor rises, and the shrine of the principal god turns its narrow face and closing doors to the entering worshiper. Here, before the sanctuary, appeared the other gods worshipped in the temple, to protect and defend the main god. Again two small chambers open off either side of the hall: that on the west preserved the wardrobe of the god, that on the east led to a small sanctuary with a little open court, from which steps rise to the "pure chapel" at a higher level. On the occasion of the New Year festival the cult image was anointed, clothed, and crowned in this chapel before being conveyed in solemn procession to the roof. The sanctuary - the "holy of holies," the "throne room" - of the principal god is an elongated freestanding structure, and as such is architecturally differentiated: a narrow passage surrounds it on three sides. Opening onto this passage are the chapels of the secondary gods; only the centre chapel behind the sanctuary is dedicated to a special form of the principal god. It has already been mentioned that there were ascending and descending processions from the "hall of offerings" to the flat roof. The roof of the temple was not, however, all in one plane; the roof level from the "hall of appearances" to the sanctuary area was higher than that above the smaller rooms and chapels at the sides and rear. The lower levels of the roof were screened from view by the high outer wall of the temple. During the New Year festival this particular area of the roof, accessible from the stairways, had a vital function to perform: the cult image (or statue) was conveyed in solemn procession to the roof where its potency was renewed by exposing it in a special roof chapel to the rays of the rising sun. At Edfu the location and plan of this chapel can still be discerned on the roof of the temple; at Dendera, on the southwest corner of the roof, the chapel itself is preserved. On the roof of Dendera there are also separate chambers for the Osiris cult. A special feature of the great temples of the Late Period is their systems of "crypts." These are narrow chambers beneath the floor of the foundations or in the thick outside walls around the holy of holies. Their location was known only to the initiated and they could be entered only by removing a stone slab. They provided safe storage for the costly votive gifts, emblems of the gods, and ritual objects in gold and silver which are listed on the walls and depicted in relief. Sometimes the crypts were at several levels, one below the other. Their concealed locations recall the story of the treasure chambers of Rhampsinit told us by Herodotus (Histories, II, 121). See also Megalithic Art. At the side before the entrance pylon to the temple of Edfu stands the birth house (Mammisi). These small temples, always present in the great sanctuaries of the Late Period, have the form of a chapel with peripteral columns bearing a sundeck. On certain festivals they were the scene of liturgical celebrations of the god and of the birth of the king. Unknown before the fourth century BCE, they emphasize the theme of the "divine child" and the "divine mother." The walled chapel within, which is treated as an isolated building, has the entrance at the front, made lower to conform with the "baldachin temple" prototype. The stone roof-slabs of the exterior gallery rest on the architraves spanning tall columns and on the walls of the chapel inside. Screens block the spaces between the columns, extending halfway up the shafts; they are decorated with low relief stone sculpture depicting the adoration of the cult of the divine mother and her child. Often above the capital is another block bearing the grotesque figure of Bes, the popular demon who watched over mother and child. After the temple of Horus at Edfu, the next most important and best-preserved of the Ptolemaic temples is that of the goddess Hathor at Dendera, begun in 80 BCE. According to the inscriptions the founding of the historic sanctuary goes back to the period of unification of the Two Lands, and King Cheops is mentioned as one of the restorers. As with all Egyptian temples, construction began with the holy of holies and ended with the entrance and the great hypostyle hall, which at Dendera dates only from the reign of Augustus. The ceiling of the hypostyle hall rests on columns with four-sided Hathor-sistrum capitals. (See also Megaliths.) The succession of main rooms and subordinate chambers at Dendera corresponds almost exactly with that of the temple of Horus at Edfu. Again there are two stairways leading to the roof. The relief sculpture on the staircase walls depicts the costumes of the members of the procession in scrupulous detail: the gods, warding off enemies, march in front; behind the emblem of the temple there follow the king and the priests with the emblems of the gods; then comes the queen with each hand swinging the sistrum, the cult symbol of Hathor; next the priests bearing Hathor's image in its shrine; closing the procession are the lesser gods of the temple. At the southwest corner of the roof stands the goal of the procession, a kiosk with twelve Hathor columns. The roof of this small building was, as representations show, once covered with a low vault; to judge from the traces of its construction left on the walls, it must have been made of wood. The temple precinct of Dendera is still surrounded today by a thick brick wall and entered through the ancient portal. The original birth house, dating from the Thirtieth Dynasty, was later cut through by the stone enclosure wall of the temple; the emperor Augustus therefore had a new one built near the entrance to the precinct. Close to the southwest corner of the Hathor temple lies the sacred lake, enclosed by walls and with steps at each corner that led down to the former water level. Alongside the south runs a narrow landing place, probably used in connection with the Osiris festival. The temple at Kalabsha in Nubia, on the west bank of the Nile some forty miles south of Aswan, was probably built under Cleopatra and Caesar. Well preserved, easily comprehended, and carefully composed in its relation of masses, it gives a clear idea of the latest Egyptian temple architecture. The sanctuary is dedicated to the Nubian god Mandulis. The landing place for the sacred barge is in an especially good state of preservation. The two pylon towers and the side walls of the court contain a great number of small chambers, a feature of this temple. The slight deviation of the pylons from the temple axis, necessitated by the proximity of the river, is cleverly compensated by shortening one of the towers. While the ground plan corresponds in principle to those of other temples, it has been considerably simplified. The temple proper contains only three rooms, all at right angles to the main axis, the last one forming the sanctuary. All three receive dim light from slits in the ceiling and in the upper part of the walls. The ceiling height decreases substantially in the direction of the holy of holies, and the doorways grow proportionately smaller. The remains of a well are in the narrow passage between the temple building and the enclosure wall. The proportions of this temple are rather unusual; the ratio of length to breadth is 200 to 100 feet. The temple would have been drowned in the waters of the lake created by the new Aswan High Dam had it not been dismantled under the supervision of scholars, stone by stone, and rebuilt on higher ground. During the dismantling there came to light the outline grid of the planning and the preliminary drawing, scored in the flat surface of the rock foundation. This carved outline was probably transferred to the site from a small-scale drawing. The long sides are divided into sixteen parts, the short sides into eleven: the grid therefore did not consist of squares, as is assumed to have been the case with the older Egyptian temples. The grid also contains proportional elevations of the facades of the first hypostyle hall and the sanctuary. 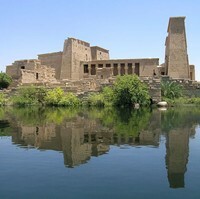 Other buildings exemplifying Late Egyptian architecture include: the Temple of Isis at Philae - built by Pharaoh Ptolemy XI; and Trajan's Pavilion (c.164 CE). For building works in Ancient Greece, see: Greek Architecture (900-27 BCE). For Roman building design, see: Roman Art (c.500 BCE - 200 CE). We gratefully acknowledge the use of material from the seminal book Ancient Architecture (first published 1972 by Electra, Milan): an important work for all students of Ancient Egypt building design, not least because of its unbelievable photography of the interiors of famous pyramids and temples.  For more information about the design of ancient buildings, see: Homepage.